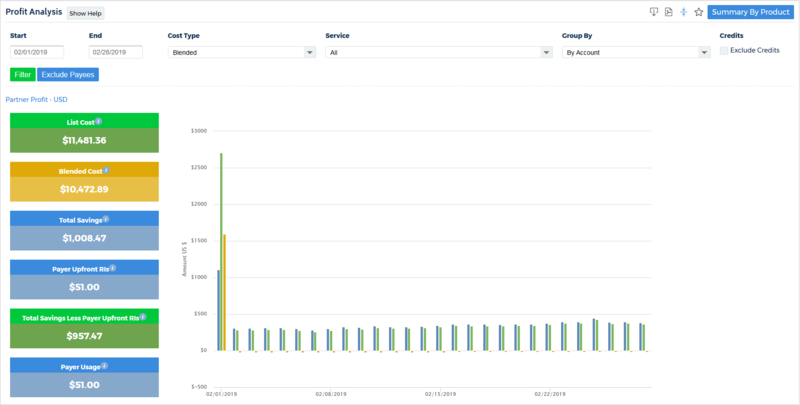 The Profit Analysis report allows you to quantify the difference between List Cost and Unblended or Blended Cost for your AWS bill. The application also lets you filter this report by date range and service so you can better manage and optimize your business's costs and profits. To access this report, go to the left navigation menu, and choose Cost > AWS Partner Tools > Report > Profit Analysis. If you wanted to compare the list cost against blended for all accounts against all services for a given month you would set your date range, cost type, and service like the screenshot and click Filter. The application will display cost and profit details including a breakdown of those details in a bar graph spanning your date range. List Cost: This will display the List Cost of all the payee accounts. Blended Cost: This will display the Blended Cost of all the payer account. Total Savings: This represents the List Cost of the payee accounts minus the Blended Cost of the payer account. Total Savings, less Payer Upfront RIs: This represents the total profit minus the upfront RI cost incurred by the payer account. Net Savings: This represents the total savings minus all the cost incurred by the payer, including any upfront RI costs. To see the profit analysis by service, you will select a service from the drop-down menu, and click Filter. The application will recalculate the totals and bar graph for the selected service. In this example, we chose EC2. To see the details by account, scroll down to the list under the bar graph. Locate your selected account and click to drill into the details for that account.